I actually arrived with five minutes to spare, but by the time I got through the large security queue (can no one arrive at games on time, eh? ), went to the toilet, went to the bar and wandered almost half-way around the stadium to get to my place, I had missed the first twenty minutes. Apparently I hadn’t missed much. Gladbach, who are in fourth place in the league, three points behind leaders Dortmund, were always going to be favourites, with their solid defence, quick counter-attacks and the hugely impressive Marco Reus, but nothing of much importance or interest happened in the first half. To be honest, I spent most of the first half (the whole twenty-five minutes that I was there) in shock that they had real beer in the stadium! I was so excited I bought a litre of it. 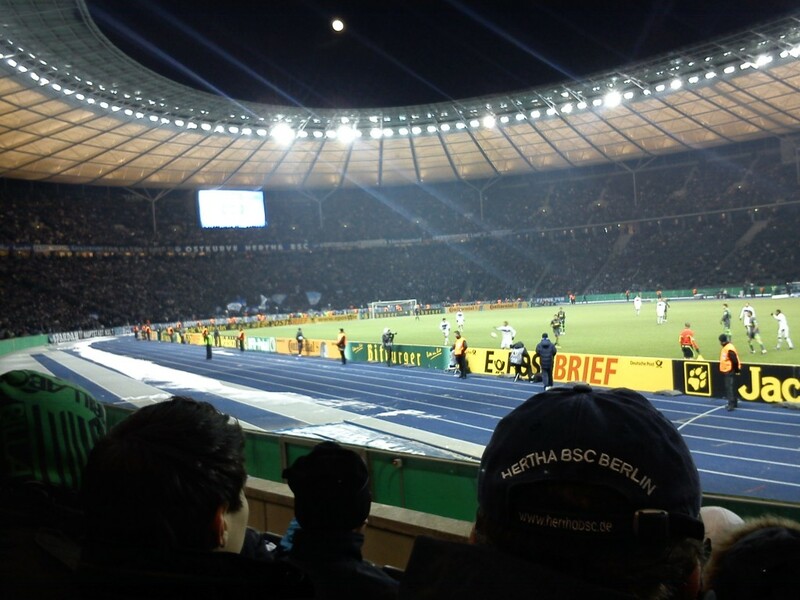 Why not – it was cold and the bar was empty by the time I got in the stadium. And those who have read this before will know my thoughts on beer and football (for those new to the site, please see here). The second half was slightly better. Hertha, who had spent most of the game not doing much, strung a few passes together and managed to boss the game for about five minutes, a spell in which ter Stegen made a good save and Hertha hit the woodwork. Gladbach’s impressive attack was busy, but without really threatening much. I spent most of the second half (well, when not shivering, drinking beer or bouncing my feet on the ground to try and get the feeling back in my toes) watching players diving to the ground. As an Englishman, it is frustrating how easily, and with how much drama, players in Germany throw themselves to the ground. I know I have mentioned this before, but it bloody annoys me. And I know it happens in England also, but I honestly think it is a lot more cynical in Germany. The beer was Carlsberg, by the way. Ironic in a country with a great brewing tradition, but, to my English readers, I promise it actually tastes like beer in Germany. 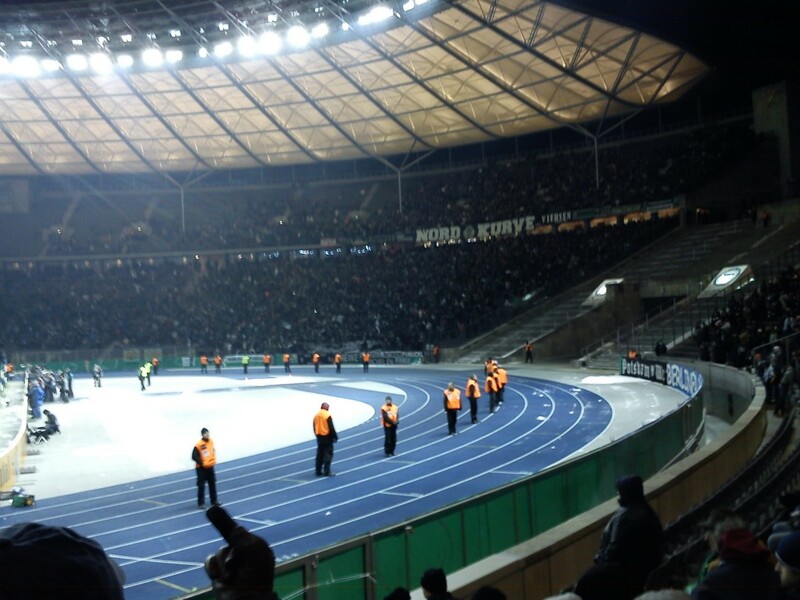 Hertha's Ostkurve. Great atmosphere, struggling team. Can I just point out that I'm surprised how well this turned out as I was shivering the whole time.I am available for weddings, Bar Mitzvahs and funerals if anyone needs a photographer? Yesterday. So, I think, with it being so cold, no one wanted extra time. But they would not get to have a say in the matter. I got another beer. The first half half of extra time wasn’t really great either. Gladbach play best on the counter-attack, and Hertha weren’t really throwing anyone forward for Gladbach to punish. Towards the end of the first half of extra time, de Camargo, who was brought on for Gladbach, was outmuscled for a through ball and went down. 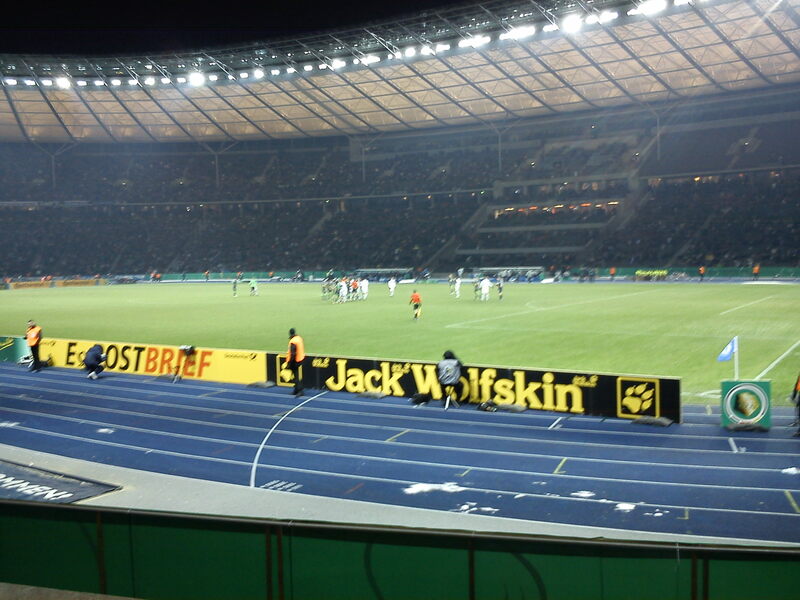 A free kick was given to Hertha for the challenge, and I turned away. When I turned back, the referee was pointing at the spot and all hell was breaking loose near the centre circle. All hell breaking loose. Yesterday. As I was sat mainly among Hertha fans (there were actually a lot of Gladbach fans dotted throughout the stadium, including some Gladbach flags in areas which are nominally home areas), the opinion was nothing had happened and that the Gladbach player had dived after a confrontation. Gladbach fans enjoy a good penalty. The middle finger belongs to the old dude in front of me. He was a Hertha fan. His night had already peaked. Yesterday. de Camargo headbutted Hubnik. Penalty for de Camargo, red card for Hubnik. You couldn’t make it up. Naturally, Gladbach captain Filip Daems scored the penalty. Hertha threw a few more players forward, and the sub Ramos (who is very Shola-like) was played through, turned the last defender, and blazed over with a shot that genuinely threatened to dislodge the snow on the roof of the Olympiastadion. Gladbach then took advantage of Hertha’s desperate attacks to break, and Oscar Wendt finished smartly in the 120th minute, a minute after coming on as a substitute. Not a deserved scoreline. Gladbach edged it on quality, but it was a poor game, and Hertha have now lost four on the bounce under their new manager. This entry was posted in Football and tagged All hell broke loose, Berlin, Borussia Mönchengladbach, Comparing strikers other than Shola to the best in the world, DFB Pokal, Germans love a good dive, Germany, Hertha Berlin, it's a German player trying to win a free kick., Marco Reus, Olympiastadion, Referees stealing games, WHAT!? REAL BEER? ?, What's that on the floor? Ah, Yesterday. Bookmark the permalink.